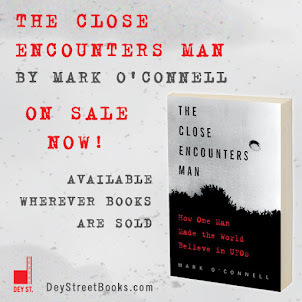 A UFO writer I respect a lot has asked me for input on her massive book, and our dialog over the last week has given me pause to reflect on the state of UFO writing and research. Yup, I'm going to get philosophical! 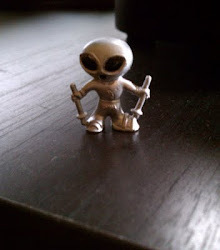 The writer in question is one of the guardians of the J. Allen Hynek Center for UFO Studies (CUFOS) here in Chicago. She has graciously welcomed me into her home on many occasions to root through the CUFOS case files, and she always has a good story to tell about some UFO personality or another. She also is the most meticulous and driven researcher I've ever met. She is writing an epic tome about the famous Rex Heflin UFO photos taken in 1965. The sequence of photos seem to show a hat-shaped flying saucer zooming around alongside a highway in California. 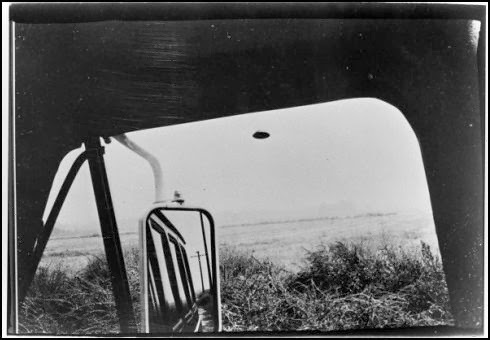 I have been familiar with these photos ever since I picked up my first UFO book as a young boy, and as a young boy they amazed me (Silly as it sounds, part of the amazement for me was the recognition that the photos were taken from the cab of a 1965-era Ford Econoline van, which was our family car at the time... you can laugh but it gave me a goofy kind of personal connection to the photos). Submitted for your approval: one of the famous Rex Helfin photos. The Heflin photos amazed a lot of other people, too, it turns out, and they have been studied and analyzed many times over the years by some very sharp people. Needless to say, some investigators over the years have found the photos authentic, some have not. I don't want to give away any spoilers, but my friend has picked apart what I am guessing is every last scrap of investigative work ever done on the Heflin photos and has come up with her own unique analysis the case. Like I said, her work is amazing. After thoroughly dissecting previous analyses of the photos, she starts at square one and conducts her own analysis... The scope of her research is astonishing, the way she builds her case is impressive and her conclusions are fascinating. I am happy to say that she did not ask me for editorial advice, because, to be honest, I would have felt thoroughly unqualified to comment on a case about which I know so little and she knows so much. No, instead she asked for advice on the presentation of the information, the organization of the contents, ways to grab the reader's attention right away... After years of writing white papers and grant proposals and case studies in the professional world, I feel I know a thing or two about organizing and presenting complicated information in an engaging and convincing way, so I gave her some ideas and she seemed appreciative. Not a very dramatic story, I know. I merely present it as an illustration of the very best in UFO scholarship. Seriously, this book should be in the reference section of your local library, and when it is released I will make sure you all know about it and have a chance to get a copy. The reason I've been thinking about this is that, by a strange coincidence, my friend's request for editorial advice comes just after an episode last week when another UFO writer offered me unsolicited editorial advice on my Hynek book, and you couldn't draw a more stark contrast between the way things should be done in the world of UFO research and literature, and the way things shouldn't be done. The person who offered me unsolicited advice asserted that if Individual A is interested in finding out about Alleged Incident X, that proves that Individual A believed that Alleged Incident X really happened. Not true. All it proves is that Individual A was curious to know about Alleged Incident X, no more, no less. Why would I take journalism advice from this person? Because what this person is really saying is that Individual A had formed an opinion -- perhaps even reached a conclusion -- before investigating all the facts, and that is something that Individual A would never have done! Which brings me to a thought about my own research. Progress on my book has slowed in the last two months for a variety of reasons, but chief among them is the fact that wonderful new research material keeps coming my way. And every time it happens, I find I need to go back over what I've written so far to see if the new material affects the narrative at all. And if it does, it's rewrite time! Sometimes the new material brings what I've written already into sharper focus, but sometimes it creates new ambiguity and forces me to take another look at some matter I thought I had long since settled. In either case, I love it, because it only makes the narrative stronger. So there's my philosophy for you. I love working in this field, and writing the Hynek book is one of the most wonderful opportunities ever to have come my way. But the world of UFOs is not always congenial or welcoming; things can get prickly and unpleasant at the drop of a hat-shaped UFO. My mission from here on out is to only spend my time and energy on people who are great to work with, who do great work themselves, and who treat the world of UFOs as the big, wonderful playground that it is. I've been following your blog since the holidays, when I randomly came across it. I can't agree more with your views on the current sad state of UFOlogy. If the current batch of sensationalistic and goofy UFO television shows are any indication, UFOs are being investigated by "true believers" who don't possess the healthy, open minded skepticism crucial to approaching this phenomena scientifically. You possess those qualities and I say "godspeed" to your writing and investigating. Don't let the ninnies and twits get you down. BTW, I think a J. Allen Hynek biopic has been a long time coming. Wow, thank you for making my day! "...one of the guardians..." JZ? Some people think Heflin's UFO bears a remarkable resemblance to a toy railroad engine wheel... wonder what she thinks ol' Rex actually photographed? Not JZ but MC, Mary Castner, and I'm not going to be a spoiler! Ah! I knew it had to be one or the other, there being few female CUFOS guardians... and, you don't need to be a spoiler, since anyone spending an inordinate amount of time and effort on Heflin's photos is likely to be an advocate of the "anomalous" nature of what the photos depict. The pictures are intriguing. I never knew until Mary told me that there was a 4th photo of a mysterious "smoke ring." If you want to do UFOlogy a favor, get Ann Druffel to release the high-res scans from the original Heflin pics she's been hording for years. Alas, I try to avoid the kind of internecine warfare that characterizes so much of the UFO research and investigation community.